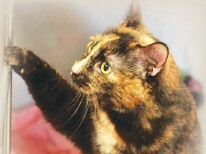 SWEET GIRL—Jesabelle is a female tortie domestic shorthair cat about 10 years old. She is sweet and gets along with small children and other cats. If you would like to adopt Jesabelle ask for ID No. A3778324 at the Agoura Hills Animal Shelter, 29525 Agoura Road. Check http://animalcare.lacounty.gov before visiting the shelter.